It is right at the edge and very nerve racking with the little ones around. I think I was at 20 something ft. Its going back and I got a short throw rear projector on the way. That's what I'm worried about! With rambunctious teenage boys that thing is definitely getting knocked in the pool! Was trying to figure out if there's a way to mount it up somewhere out of harms way. Let us know how the rear projector works!! Will do. The projector I got on order only needs like 5 ft for 144 in screen. The screen I have accommodates rear projection so we should be good. Throw distance can be an issue without the right projector. The epson 1440 is a super bright projector with great throw distance. Bright enough to use even before sunset in some instances. Has a throw distance of 30 feet too. Highly recommended. very simple setup. we just use it so we can watch movies at nighttime while we are in the pool. i have a USB harddrive with over 1200 movies on it. i just plug it into the projector and we watch a movie. it actually has a very good picture for what we want. 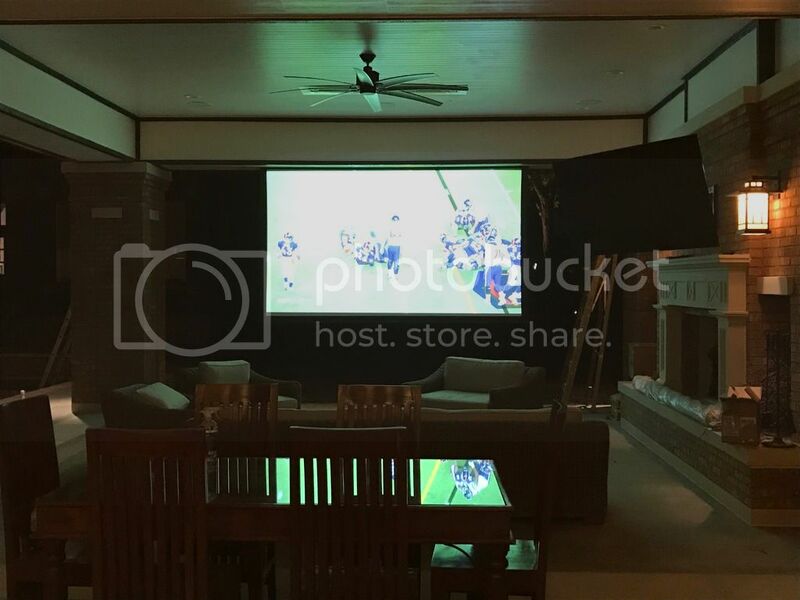 this projector has a very long throw. i think it has a max throw of 25'. i have it mounted about 20' away from pool, on a 150" screen. like i said, it is not perfect, but it works for our needs.